receive $10 valet parking when dining in our restaurant. Come enjoy the new menu offerings at the re-named and newly renovated Ghost Light Restaurant and Lounge. 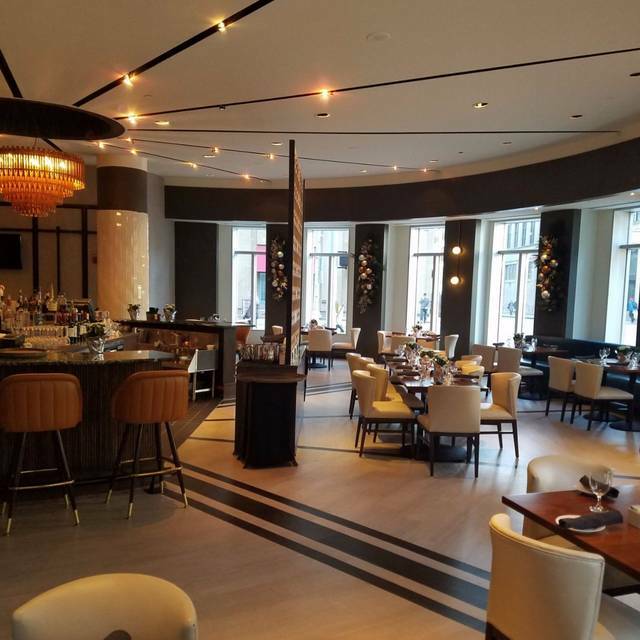 Along with the Crowne Plaza Cleveland at Playhouse Square $6 million dollar renovations, our restaurant was also the recipient of updates and a new name! Open for breakfast, lunch, dinner as well as libations before kicking off your evening on the town. Specializing in everything from sliders, Cleveland pierogis, mussels, homemade pizzas, our share plates make for a spectacular pre-show meal! Decent food but drinks are expensive. the server was terrible . she didnt have a pad and pen so screwedup the drinks, then food . She got everything wrong. I am a server myself and am very forgiving usually, this was ridiculous . the place was empty, and now i know why. give them the tools they need to do there job effectively . train your staff!! This is across the street from the theater and should be packed. Good was very good! It's is a little pricy but definitely good, especially for staying open so late. Food was ok. A bit over cooked. Would like to see more variety on the menu. Restaurant itself was beautiful!!! A hotel bar/restaurant. Arrived at 6pm on Friday before a show at Playhouse Square. Seated quickly and took our drink order - took about 5 minutes to return. After placing our dinner order, waitress shortly returned. "The kitchen is in chaos. What did you order again?". Took about 12 minutes to get our order of tuna and a rueben sandwich. Both pretty good. Quick checkout. There are other better options for dinner before a show, we just waited too long to find one. Fun casual restaurant. Nice city view. Website view of the place was accurate. Good menu. Though the calamari was good with nice sauce, it was a bit overdone. But great soups, and a good reuben. Did not want a full meal before going to the theater, so this was a great place a block from Playhouse Square. Food lacked flavor. And expensive for what you actually get. The waitress was very quite and almost whisper. It was very hard to hear her. The food wasn’t that good and my food had a freezer burned taste too it. The service was fast and perfect before going to playhouse square. The food was amazing. The service was exceptional also. Definitely will be back. A little expensive but a good place to go to before going to Playhouse Square. Server was excellent and very friendly. Dined after a show with our 6 yr old granddaughter. Theatre salad was very good. Greens were fresh and crisp. Added grilled salmon which was well seasoned.. Reuben was a light version with half turkey which we enjoyed. Children’s menu had a good pasta. Cheesecake for dessert was excellent. Had quite a few healthy options on menu like cauliflower steak and tofu lettuce wraps which I appreciate and will try next time. I heard the restaurant won judges choice at Cleveland restaurant week kickoff event which I why I went with the restaurant week offering of theatre salad. Good for family. Clean. Comfortable. Will return. First time at restaurant. Selections were nice. Asked about making a starter an entree-sized meal. Waitress immediately said no without checking with the kitchen. Was a bit put off by that. Ordered a salad with grilled chicken and it was okay. No one refilled the water glasses without having to chase someone down. Same with the bread. The restaurant was not super-busy, so that wasn't the reason for the lackluster service. I may try it again. The waitress was HORRIBLE. No personality. No knowledge of the menu. Not at all attentive. The food, or at least three of four meals, came poorly prepared ... cold, undercooked, uncooked. One meal didn't come until everyone else was done. It was only Salmon Salad. The Salmon was raw. Yes, the Salmon dish was comped. Big damn deal. They offered to redo it. Did I mention that there was a deadline to be at the theater. NEVER GOING BACK. Obviously they changed the name of a terrible restaurant, thinking that would attract customers back. The place was empty, but that didn't help either the quality of the food or service. We reserved a table for 5pm on Open Table to be sure we got right in before our show at Playhouse Square Sunday night 2/17/19. Upon arrival, we were greeted with sign "to seat ourselves" and the fact there was only one other table with customers should have been our first clue this wasn't going to be good. After a small wait, the server took our drink and appetizer order. Appetizers were $6 for three very small spring rolls and $6 for four small fried raviolis. My daughter and I both ordered the New York strip steak. It came with polenta and roasted carrots. Polenta was chunky not creamy, and the carrots had some chemically taste. The steak was chewy, hard to cut, not tender at all and the burnt onion sauce was horrible - so bad we didn't even finish. The server was not attentive, busy drinking her energy drink at the bar and using her smartphone. Our water glasses sat empty for a long time and finally the manager refilled but without even asking how our meal was. Then our bill came... Open Table and Ghost Light website advertised the NY Strip as $29, the menu said $32 but we were charged $39 per plate. I questioned it and even though they quickly fixed it, it was the $32 price even after I told her the online prices. We paid and left to go across the street for dessert! Very disappointed how much we paid for very, very poor quality and service. Sorry we didn’t read the other reviews before we went. We will not be back. The manager Jordan did an amazing job. I called and asked if any tables might be opening sooner because we were going to a show at Playhouse Square and she actually called me back not too much later and said our table was ready! She put our order in when we got there and we made it in great time to our show! The wait staff is a little under trained but didn’t take away from the overall experience. We wanted a change from all of the other pre-theater spots, so we gave Ghost Light a try. Food was fine--nothing more, nothing less. Service was lacking. When the hostess showed us to our table, she complained that Open Table had overbooked for the evening. Conversation with our server went like this. Me: "What kind of infused vodka do you have?" Her: "I know we have some, but I don't know what kind." Husband: "What's the soup of the day?" Her: "I don't know." It took FOREVER for our first course to arrive. I was still eating my salad when dinner showed up, so I had two plates in front of me. We were never offered dessert or an after-dinner drink. Having said that, my Theater Salad was tasty as was the grilled portabella with balsamic and quinoa. My husband was satisfied with, but not blown away by, clam chowder and grouper. We may try again before or after another show, but probably just for drinks and apps. Took our family of 6 here prior to attending a show at the Hanna Theater. The food was bland at best. The service was essentially nonexistent. We would not recommend it and will not be back. Save your money! Great healthy food at a great price. We were surprised that there were only two tables with lunch customers, including ours! The French onion soup was fantastic. Dessert and salmon were smaller than expected - a little over priced. Service was very friendly, but the wait staff lacked knowledge on the details of the menu. I have never spent over $100 a restaurant and left felling hungry and disappointed. I honestly felt bad for the bartender who was there by herself trying to run both her entire bar and the service bar. The floor was also understaffed and we noticed we weren't the only ones there disappointed with the poor service we were receiving. The entire staff could not handle the evening and it was averagely busy. A majority of people were eating there before shows at the theatre's that evening and you think they would have appropriately staffed to accommodate the rush. The food was below average & over-salted. I wish I could say it was unforgettable but you never forget bad food. We left wishing we ate somewhere else since we are married with 2 small children and don't get to eat out as often as we would like. We will definitely never be back. We had a rough time the first evening we dined at Ghost Light in February of this year but Ryan, the assistant manager, asked us to return to allow them a chance do better and they sure did! The service was attentive and the food was delicious! We were a group of 10 dining pre-theater and will definitely go back!! Very pleasant experience all around!!! We were on our way to a show and our 6 reservation was more than enough time!! Will defiantly go back again soon!! We like the waitstaff. They are friendly and knowledgeable. The room might have used one more when we were there. We had a very nice lunch! If I could give them one piece of advice it would be to arm their servers with a cheat sheet of the days soup and any specials. This place is in the perfect location if you are looking for a place to go before seeing a play at Playhouse square. My wife and I used to frequent this place when it was the Wyndham. The Crowne did a great job on the renovations and the ambiance of the restaurant is very nice. A few things of note, they should provide a liquor list. The wait staff did not know what they had for liquor. We did let them know we had a place to be and were expedient with service. I had different places in my mind to check out. But, after checking in, we decided to try lunch, and had a nice experience. I had already booked a 7pm dinner for 4, but it was set up for "just in case". Because of the weather, we decided to try the restaurant, and we loved the staff, meal, and price. I think the manager's name was Nick? Anyhow, he was a likable guy, and we enjoyed ourselves. We wanted a place to go near playhouse square that we've never been to before. We were pleasantly surprised at how good everything was from the food to the service. The French onion soup was divine. We would definitely come back for another time to try out their happy hour menu. Lobster Mac and cheese not good, salads are great. Great place to catch a bite before catching a show at Playhouse Square. We came to the Ghost Light after seeing a show at Playhouse Square on a Wednesday evening. This was one of the few restaurants open after 10pm when the show was finished. We had grouper and mashed potatoes which were very good and reasonably priced. Cocktails were good around $8 each. We were the only couple at a table in the restaurant so it was very quiet, too quiet. The service was okay but should have been quicker as we were the only customers at a table. There were a few people at the bar. This restaurant is inside the newly renovated Crown Plaza and is decorated nicely but there is just not enough business to make the ambiance warm. We chose Ghost Light before a play downtown on a Wednesday. It was a slow night so only the bartender tended to the entire restaurant. She was kind but service was awful since she carried the entire restaurant. Salmon came out raw and was sent back. Other food was average. I like the location and it’s a visually interesting space....but I won’t go back for more than a happy hour drink. Smell of bleach was so strong had to leave before our server even gave us menus.